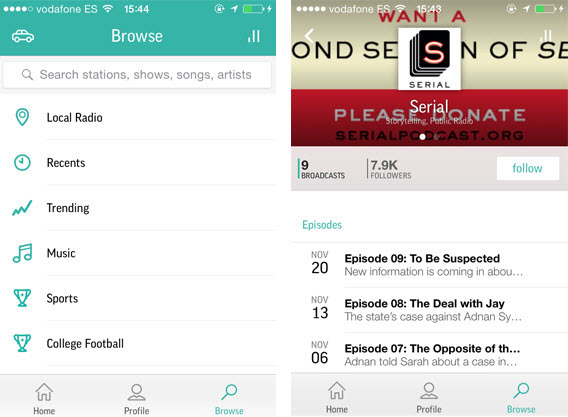 The success of Serial may have you hunting for a good podcast app that’ll ensure you don’t miss an episode. Whether you’re a heavy podcast listener looking to manage your array of audio content, or a newbie simply looking to discover some new or interesting podcasts that can capture your attention, there are plenty of great options for iOS and Android that’ll help you make the most of what’ll most likely turn into your new obsession. The stock Podcast app on the iPhone is decent, but it’s pretty basic when it comes to extended features or customization. While a lot of podcast apps offer the same standard features, some are better than others at helping you find, manage, and playback podcasts. 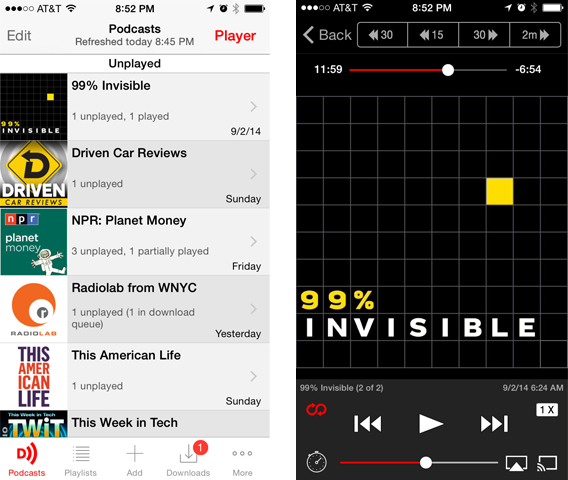 Here are the best podcast apps for iOS and Android. 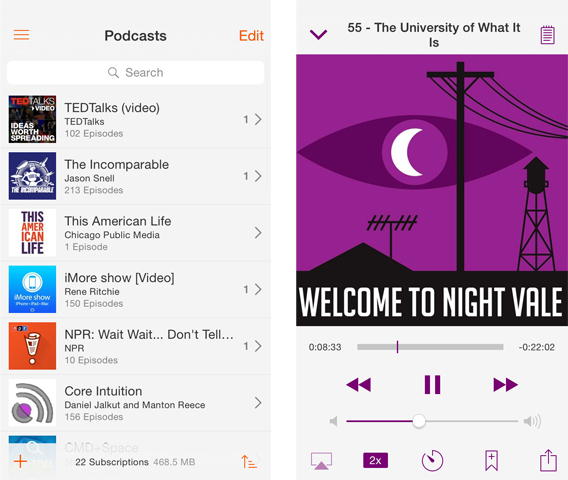 As far as podcast apps go, Overcast is one of the simplest yet greatest apps on the market, attributed in part to it’s clean interface. It’s easy to maneuver and even easier to find new or related podcasts, and you can even connect your Twitter account to get recommendations from people you follow on the social network. There’s also ‘Starter Kit’ podcast bundles grouped by category if you’re new to podcasts and aren’t totally sure what you’re looking for. While the download itself is free, you’ll need to pay $4.99 to unlock the premium features, which really make the app what it is. This includes cellular downloads, unlimited playlists, a sleep timer, and playback speed control with exceptional sound quality, one the best features of the app (and better than a lot of the ones on this list). Pocket Casts has gotten a lot of love from users. Like Overcast, it’s simple, intuitive, and has a really great interface, making the experience seem almost native on iOS and Android. The experience is based on seamlessness, meaning you can set automatic downloads (like when you’re connected to Wi-Fi), set how many podcasts you want to keep at a time, and sync between Android and iOS devices with support for both Airplay and Chromecast. You can also customize playback speed (from 0.5x to 3x) and choose a custom time frame for skipping ahead or going back. Custom filters make it easy to sort through un-played episodes and create your own categories. iOS users have the option of controlling podcast playback from the Control Center and lock screen, while Android users have the added bonus of a widget. Although not as visually appealing as Overcast and Pocket Casts, Downcast is still a great alternative for listening to podcasts on your iOS device. It’s bottom toolbar will look familiar to iPhone users, making navigation really simple. Aside from standard features available in other apps like playback speed control and auto download, you can also rename podcast titles to manage them easily. A big plus is a desktop app for Mac that lets you sync your podcasts via iCloud. 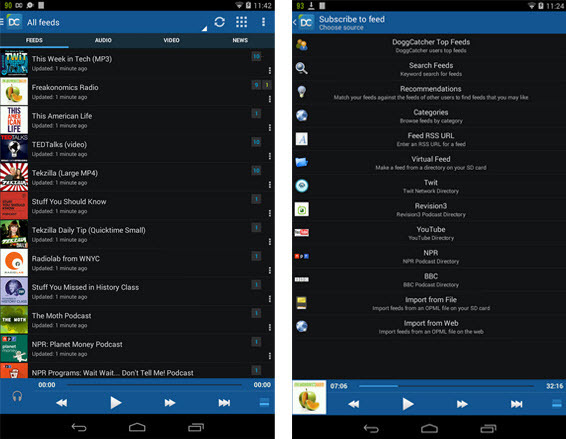 DoggCatcher is one of the most robust Android podcast apps out there, letting you manage both your podcasts and news feeds in one app. It’s got a ton of options for finding podcasts, including support for RSS feeds and a bunch of podcast directories, giving you plenty of options to find and get what you’re looking for. Within the app, you have a separate sections for Feeds, Audio, Video, and News to let you manage your podcasts a bit better. DoggCatcher also remembers the play position of your file so that you can continuously go back to your podcast without worrying about losing your place. Unique to DoggCatcher, it has a really active user community, which helps keep the developers busy, constantly improve the app. There’s a lite version of DoggCatcher that you can try before taking the plunge with the full version. 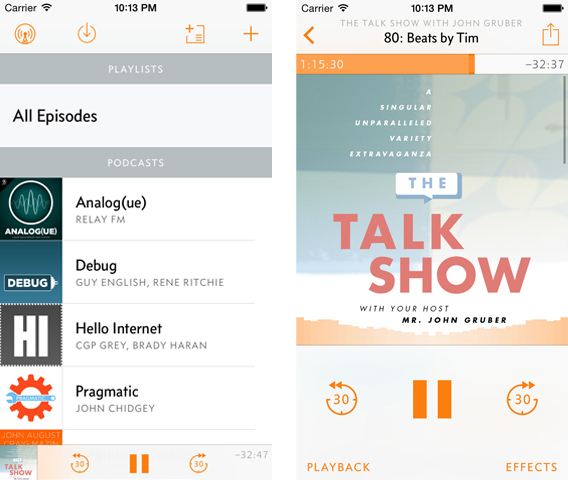 Instacast is a fairly basic but useful podcast app for iOS. Similar to Overcast, it’s got a really nice user interface with a great media player, but not as many options. In the 5.0 version, you’ll see a complete redesign and a dynamic playlist feature that lets you queue episodes to play back to back. If you click to add a podcast, you’ll see the most popular podcasts, a section for authors, genres, and the option to search for something specific. You can also set the app to search podcasts from 1 of 18 languages. While the app is free, a few paid extensions will give you Night Mode (white text on a black background) and let you search for keywords within podcasts. You can also download the accompanying Instacast app for Mac to sync with your desktop and sign up for an Instacast Cloud Account. Podcast Addict is like a free version of DoggCatcher, a robust Android app for managing your podcasts, chockfull of features. Podcast Addict is best for its customization, letting you change themes, customize widgets, customize each individual podcast, and change display modes to either list or grid mode. Not only can you manage your audio and video podcasts, but you can also integrate RSS feeds and YouTube channels within the app, as well as use it as the default media player on your Android device, making it a one stop shop for your audio/visual content. You’ve also got all the standard options, like controlling playback speed, a sleep timer, and a fully customizable widget. 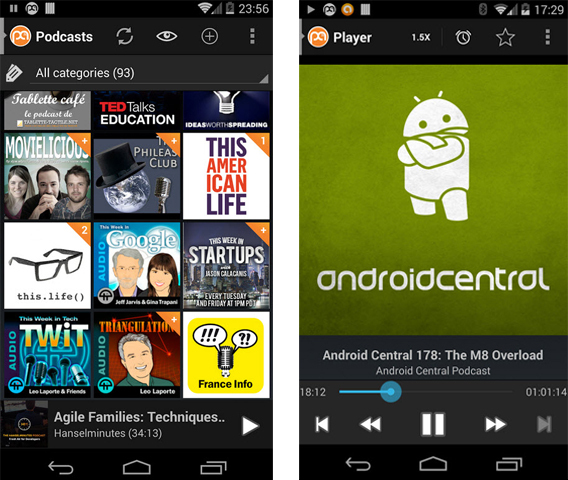 Podcast Addict integrates with Android Wear and supports Chromecast. Bringing together radio channels and podcasts, Stitcher is really handy when it comes to finding and managing all your audio content in one app. One of the best features is the Front Page, which you can filter by headlines, new content from your playlists, or recommendations, to get the most relevant and new content as soon as you open the app. If you click on an audio file from the Front Page, you’ll get continuous playback with the next item in the feed. Within the audio file itself, you have the option to share it, comment via Facebook login, or save it to ‘Listen later’, as well as a recommendation feature showing what other users are also listening to. 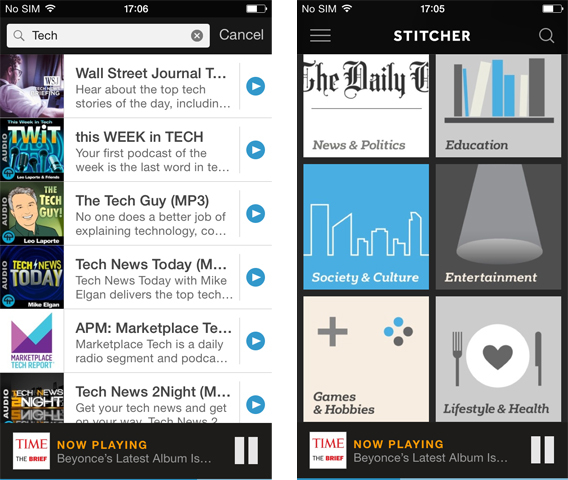 Overall, Stitcher is a really great app if you don’t want to limit yourself to podcasts. 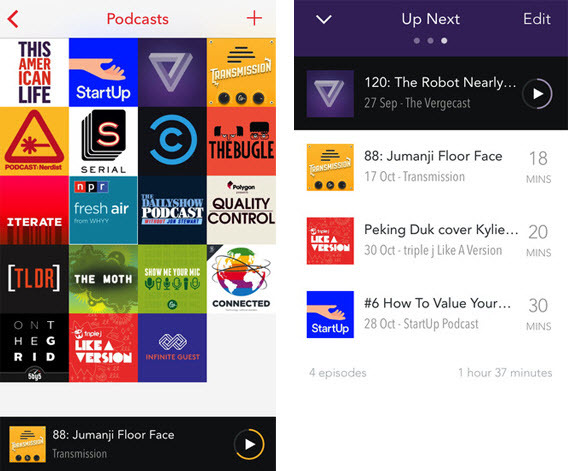 While it may not be your immediate go-to function when thinking about TuneIn, the free app for iOS and Android has a section for top podcasts, and a search function that’ll help you find them. You can follow the podcast for it to show up in your profile, where you’ll be able to access episodes, but that’s about the extent of it. 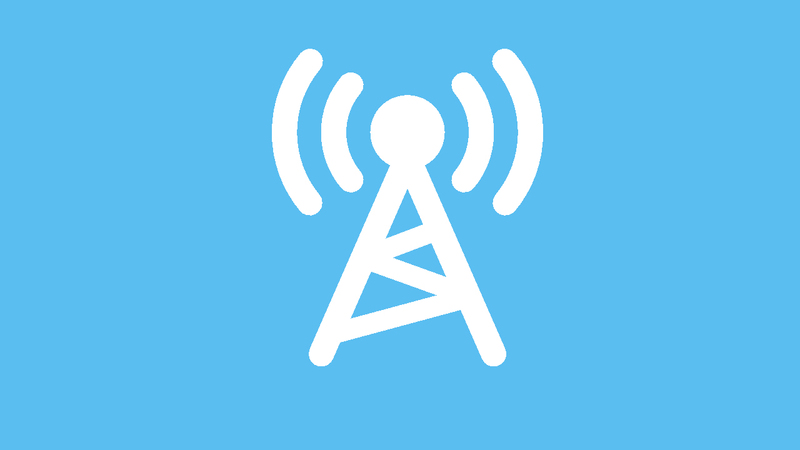 It’s not ideal if you’re a heavy podcast listener because it’s not optimized for managing podcasts or even categorizing different types of content, but the app itself is easy enough to use so that if you’re a heavy radio listener that dabbles in podcasts (or if you don’t want to download a separate podcast app), you can get them from TuneIn Radio. Whether you’re a podcast newbie or a seasoned vet looking for a better way to manage your audio content, at least one of these apps is certain to cater to your podcast-listening needs.